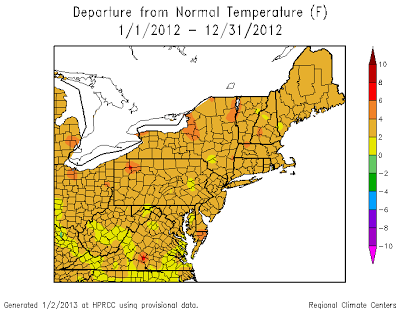 As posted earlier, 2012 was the warmest year on record for many major cities in the Northeast. Preliminary data from the Northeast Regional Climate Center in the table below show that it was also the warmest on record for 8 of the 12 states in the region and for the region overall. Hobart recorded it’s hottest day in 132 years of records just before 2pm today, with 41.3˚C. This broke the previous record of 40.8˚C recorded on January 4, 1976. Overnight the temperature in Hobart remained above 25˚C, 13˚C above average and the warmest part of the state. The official low will be recorded as 23.6˚C from 9am yesterday, Hobart's highest January minimum on record. The extreme heat is due to a northerly airstream from the mainland. The northerlies will strengthen today, causing severe to extreme fire dangers through eastern, central and northern Tasmania. RECORD WAS 54.4 DEGREES IN 1921. RECORDS FOR CHICAGO DATE BACK TO 1872. RECORD WAS 52.8 DEGREES IN 1931. RECORDS FOR ROCKFORD DATE BACK TO 1906. BACK TO 1883...AND SPRINGFIELD DATE BACK TO 1879. 2012 was the 2nd warmest and 10th driest year on record for Springfield. While overall average temperatures were the 2nd warmest on record...2012 did feature the warmest average high temperatures ever recorded...at 71 degrees. The previous record was 70.1 degrees...set in 2006. The temperature never fell into the single digits in 2012...which is a rarity. In fact...through new years morning...it has been a record 690 days (and counting) since single digit temperatures were last observed in Springfield. The previous record was 406 days...ending on March 10 1998. Temperatures last fell into the single digits in Springfield on February 11 2011...when the low temperature was 5 degrees. 1998. RECORDS DATE BACK TO 1893 AT SOUTH BEND. SINCE COMPLETE ANNUAL TEMPERATURE RECORDS BEGAN THERE IN 1879. 53.5 DEGREES SET IN 1931. TEMPERATURE OF 52.9 DEGREES. THE RECORD IS 53.4 SET IN 1921. THE FOURTH WARMEST YEAR ON RECORD. THE RECORD IS 53.6 SET IN 1921. THIS BREAKS THE OLD RECORD OF 50.9 SET IN 1998. THIS BREAKS THE OLD RECORD OF 50.6 SET IN 1921. GRAND RAPIDS MI DURING 2012. THIS BREAKS THE OLD RECORD OF 52.4 SET IN 1921. WAS 4.6 DEGREES ABOVE AVERAGE. 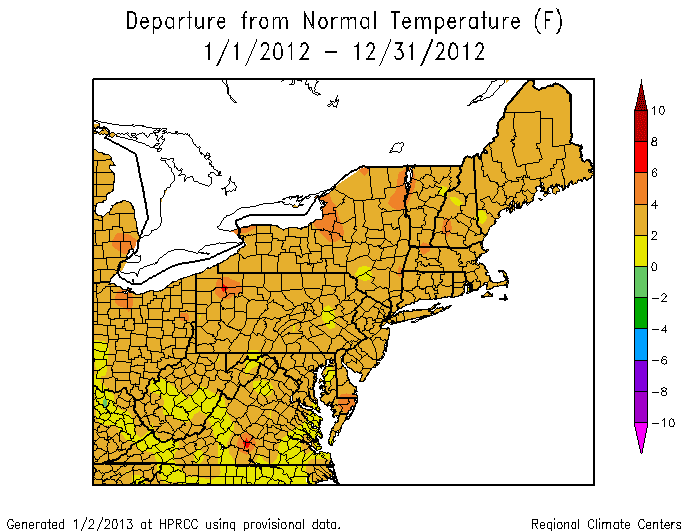 2012 will be remembered as the warmest on record for Rochester. March crushed its previous warmest on record by over 6 degrees, setting 18 daily high temperature records. On the whole, 33 daily records were set or tied for warmth, with the no cold records. July baked the region and was the 4th warmest month on record for Rochester. 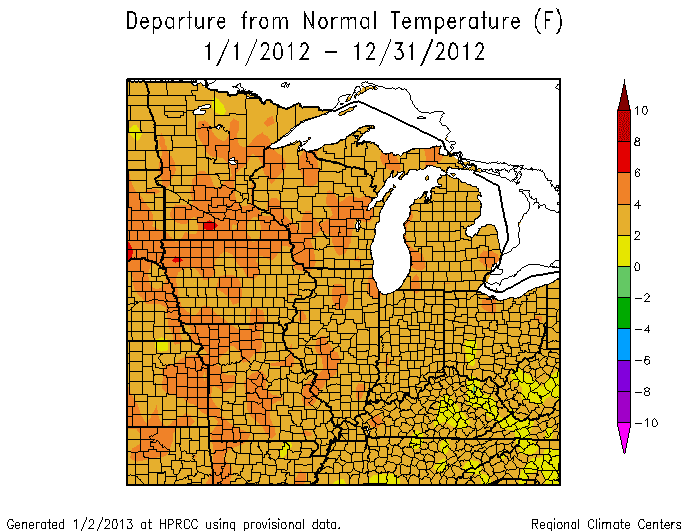 Amazingly, 7 months in 2012 set top 10 records for warmth with 2/3rds of the days recording above normal temperatures. Warmest spring on record at 53.8 degrees. 2nd warmest summer on record at 72.4 degrees. The official climate locations of Duluth, MN and International Falls, MN will both finish the year as the 3rd warmest since records began. Below are the current rankings for warmest average annual temperature. * With an average temperature of 56.0 degrees, 2012 was the warmest year on record in Des Moines. This smashes the old record of 54.5 degrees set back in 1931. * There were 42 daily records set this year, this ties the number of daily records in a year also set 1936. The next highest of any year is 35 set in 1991. These records include 2 for daily record snowfall, 4 for daily record precipitation, 16 for daily high minimum temperature and 20 for daily record high temperature. * The 20 daily record high temperatures for 2012 is the most of any year on record. Two years have 19 daily record high temperatures – 1934 and 1936. * There were 279 days without measurable snowfall starting on March 5th and extending through December 8th. This is the longest streak on record without measurable snowfall. The old record was 277 days set in 1889. * There were 244 days that had above normal temperatures, 100 days of below normal temperatures with 22 days recording normal temperatures. * There were 120 days this year that had a departure of 10 degrees or more above normal compared to 15 days of 10 degrees or more below normal. In other words, almost one-third of all days this year were 10 degrees or more above normal. * There were 60 days this year that had a departure of 15 degrees or more above normal compared to 2 days of 15 degrees or more below normal. * There were 21 days this year that had a departure of 20 degrees or more above normal compared to no days of 20 degrees or more below normal. * There were twelve days this year with an average temperature of 25 degree or more above normal. Seven of these occurred in March and early April during the extraordinary warmth during that time. 1973, WHEN THE AVERAGE TEMPERATURE WAS 57.2 DEGREES. 2011, WHEN THE AVERAGE TEMPERATURE WAS 56.5 DEGREES. WHEN THE AVERAGE TEMPERATURE WAS 57.2 DEGREES. AVERAGE TEMPERATURE OF 56.3 DEGREES. 1931 AND 1998, WHEN THE AVERAGE TEMPERATURE WAS 58.2 DEGREES. 1998, WHEN THE AVERAGE TEMPERATURE WAS 54.1 DEGREES. 2011, WHEN THE AVERAGE TEMPERATURE WAS 48.3 DEGREES. BINGHAMTON NY, AND AVOCA PA. DEGREES. THE PRIOR RECORD WAS 51.5 DEGREES SET IN THE YEAR 1931. DEGREES. THE PRIOR RECORD WAS 49.2 DEGREES SET IN THE YEAR 1998. FOR AVOCA PA, THE MEAN TEMPERATURE WAS RECORDED AT 53.0 DEGREES. THE PRIOR RECORD WAS 52.4 DEGREES SET IN THE YEAR 1921. RECORD SINCE 1820. THE OLD RECORD WAS 51.4 DEGREES SET BACK IN 1828. AVERAGE TEMPERATURE OF 48.8 DEGREES. YEAR ON RECORD SINCE 1949.